Sterling silver earrings made by Ola Gorie Jewellery in collaboration with the Pier Arts Centre echoing the designs of jewellery made by Alan Davie for his late wife Bili. Edition of 50. Alan Davie is one of Britain’s most respected artists. Born in 1920 in Grangemouth, Scotland, he studied at Edinburgh College of Art between 1937 and 1940. 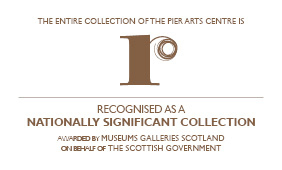 The Pier Arts Centre houses a number of works by Davie. Although renowned for his painting, Davie is also a skilled musician, poet and jeweller. His enthusiasm and passion is apparent in all he does. The Pier Arts Centre has collaborated with Ola Gorie Jewellery to create an exquisite limited edition collection of contemporary sterling silver jewellery echoing the sensitivity of the pieces made by Alan Davie for his late wife Bili. Each piece comes boxed with a provenance card detailing edition number.